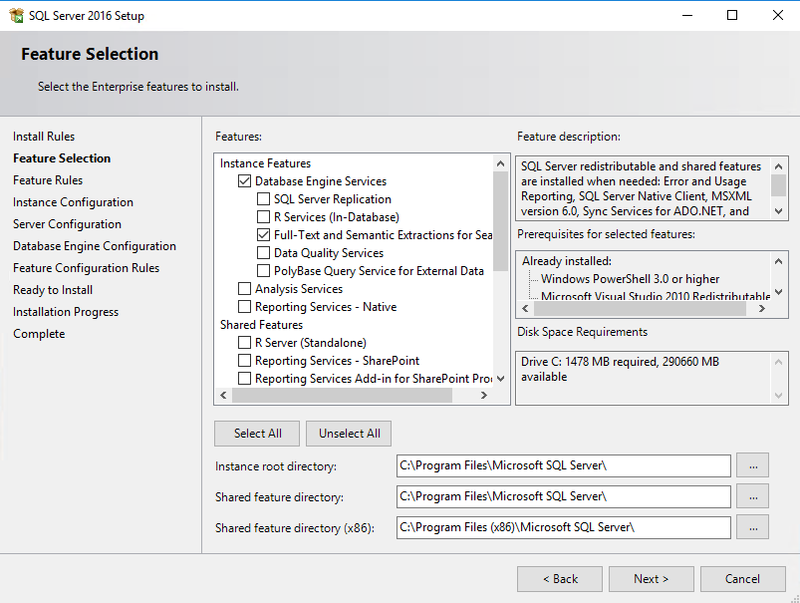 The following PowerShell code is to install all the necessary IIS components for System Center Operations Manager (SCOM) 2016 Web Console on Windows Server 2016. You can also find this in Microsoft’s TechNet Gallery, HERE. In this post, we can now track the charges accrued by our VMs and ASR. 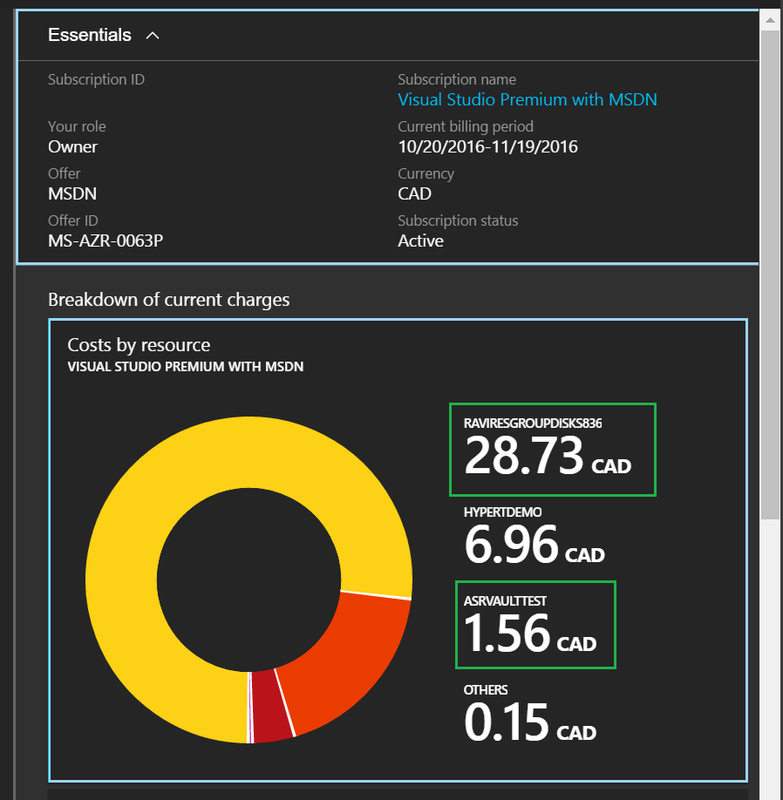 Azure’s Billing (currently in Preview) breaks down the costs per resource group (RG), and components within that RG. If you go into your Billing via Marketplace, you can get a complete breakdown of the costs you are pilling up by using various services such as ASR. You can also drill down by viewing the Burn rate, which breaks down the costs per service/resource. 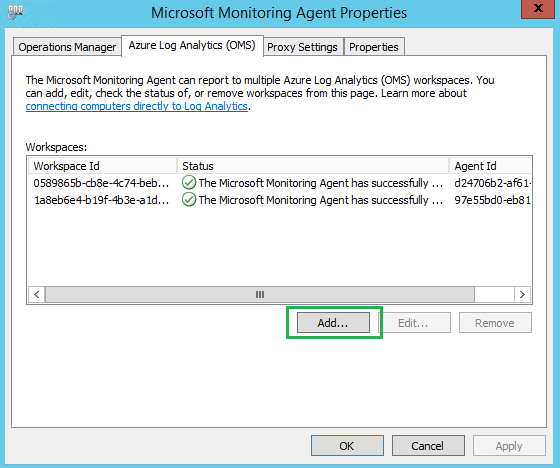 Earlier this week, I posted on how the OMS/Microsoft Monitoring Agent (MMA) can be dual-homed for multiple OMS Workspaces. 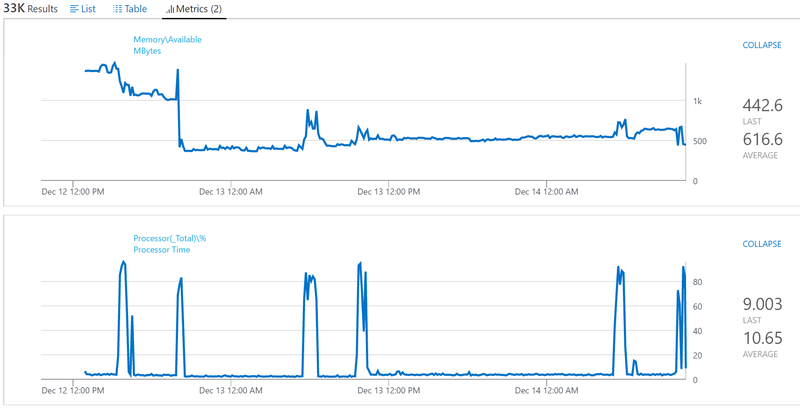 In the OMS Query below — making use of OMS’ Log Analytics, I checked the performance data in the last 48 hours. Unfortunately I cannot go any further, since the MMA was deployed earlier in that day, and the second OMS workspace was added later that afternoon. This server was being patched with 90+ Windows Server OS patches around 8PM. Unfortunately I only have 3 OMS Workspace’s to work with at the moment in this environment, but with that said, I can surely say a minimum of 3. If you have the ability to test more than 3, I would love to find out! Today I learned that the MMA (Microsoft Monitoring Agent) has the ability to be “dual-homed“. Similar to what we have seen in the past with the System Center Operations Manager (SCOM) agent and dual-homing it to multiple SCOM environments/Management Groups, the same can be said for the Operations Management Suite (OMS)/MMA agent. By going into the MMA properties, you can add multiple OMS Workspace IDs. This is great if you want the Computer reporting to multiple OMS Workspaces and/or Azure Subscriptions, as was the case for me today. 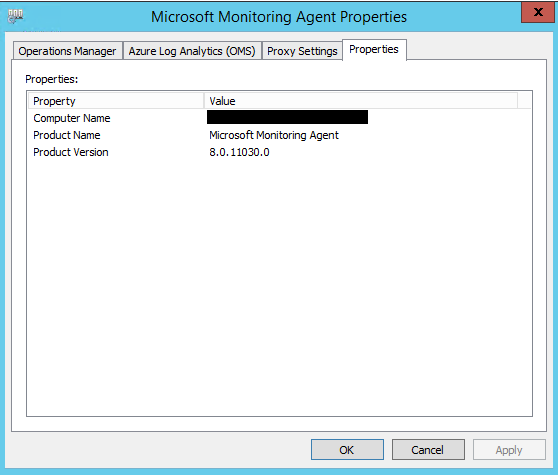 Simply launch the MMA agent, and within the Azure Log Analytics (OMS), add your OMS Workspace ID here. Note, this works for the MMA version, 8.0.11030.0 — Windows. Has not been tested against the Linux Agent. Not too long ago, Microsoft announced the support of Windows 2016 and Azure Site Recovery (ASR). Microsoft’s announcement can be found HERE. With that said, I decided to setup ASR with my Hyper-V 2016 environment. Rather than the typical blog posts (screenshots etc.,) I decided to create a step-by-step video that demonstrates how to setup ASR with Windows Server 2016 and Hyper-V. That video can be found HERE at Channel 9. 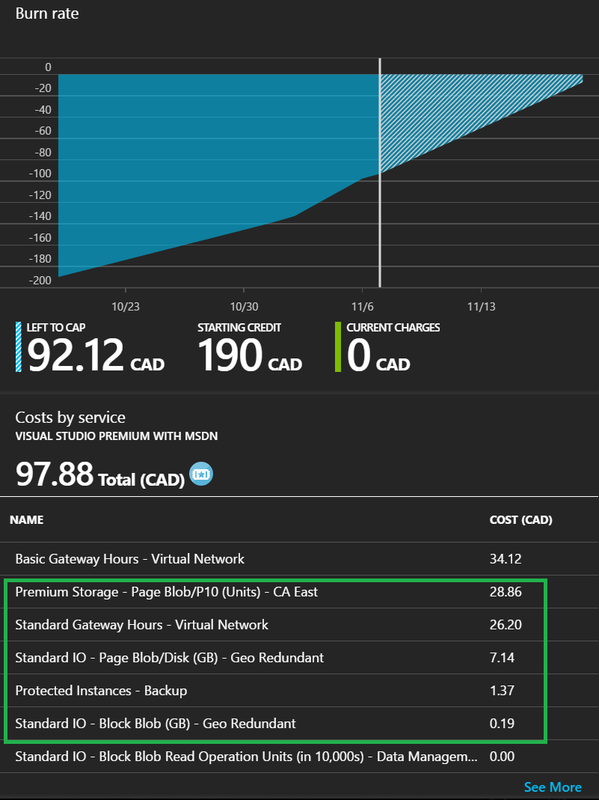 In addition this post is a series of blog posts for Azure Site Recovery (ASR). 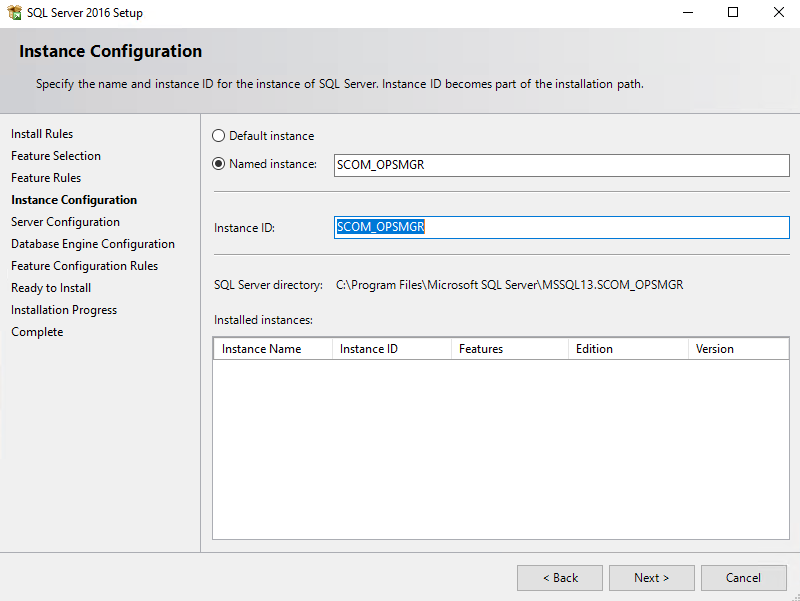 The following is a guide on how to install SQL 2016 for your System Center Operations Manager (SCOM) 2016 environment. 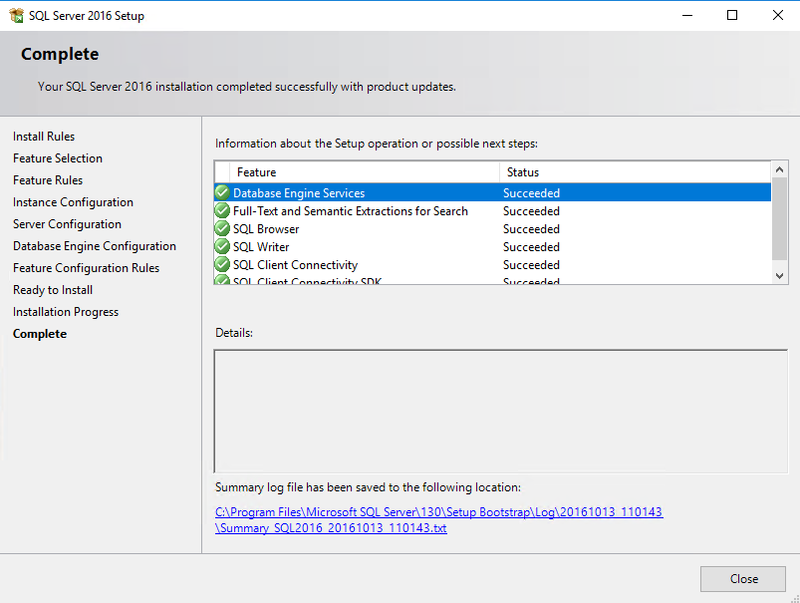 I will be installing SQL 2016 on a brand-new server with Windows Server 2016 installed. To begin, I am going to set the following accounts as a Local Administrator on the server. 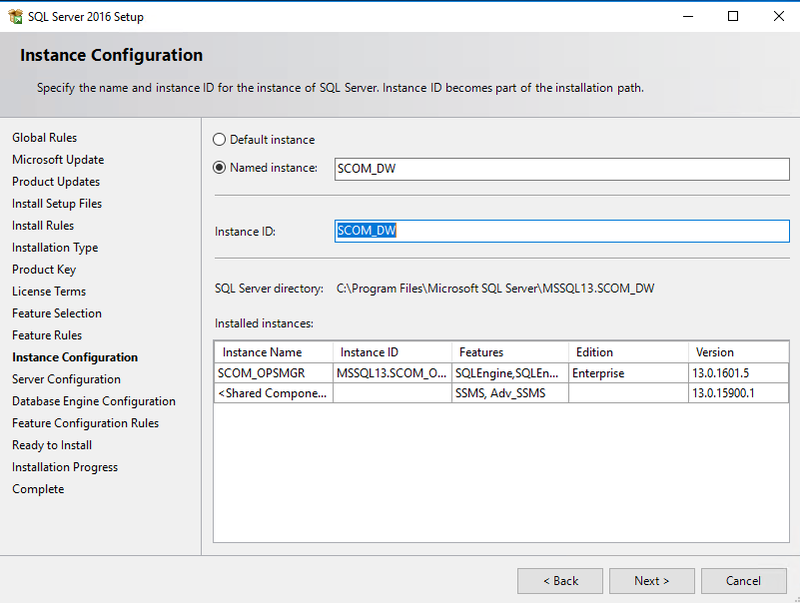 Also, I am going to be creating two SQL instances, one for the Operations database, and the other for the Data Warehouse. Since this is for my personal lab, I am not dedicated storage/drives for the databases. 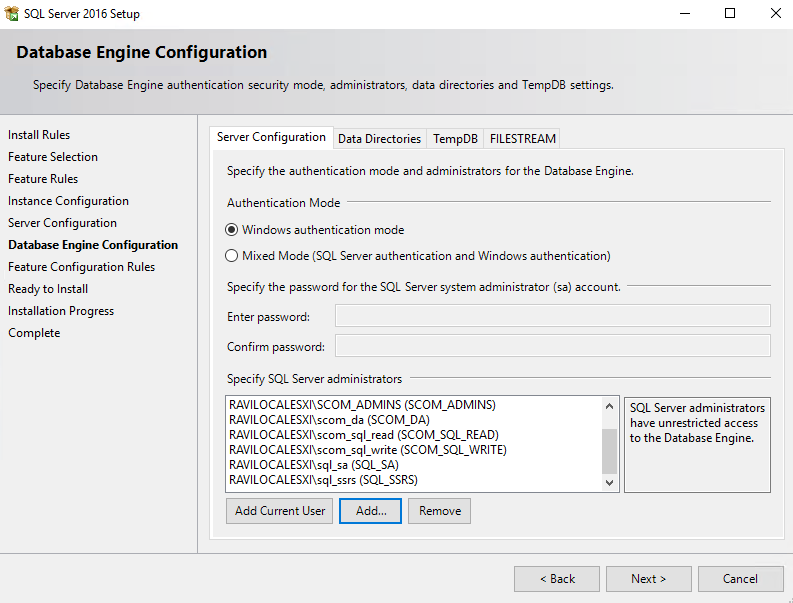 First thing I noticed, between SQL 2012/2014 and SQL 2016, a few changes/features have been removed/added. 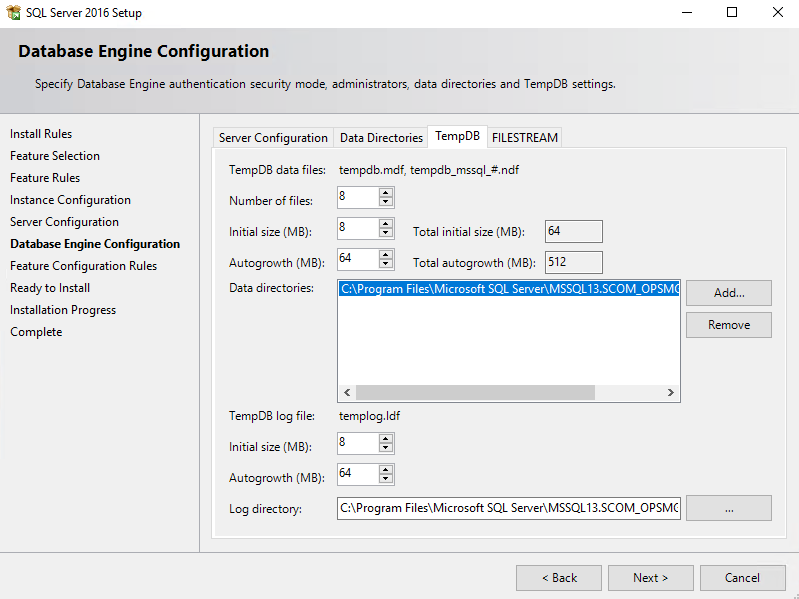 One that stands out is, the SQL Server Management Studio (SSMS) console is no longer here. Hmm.. I guess we can always connect to the databases from a console on another server/PC. As mentioned, I am dedicated an instance for the Operations DB, and one for the Date Warehouse DB. 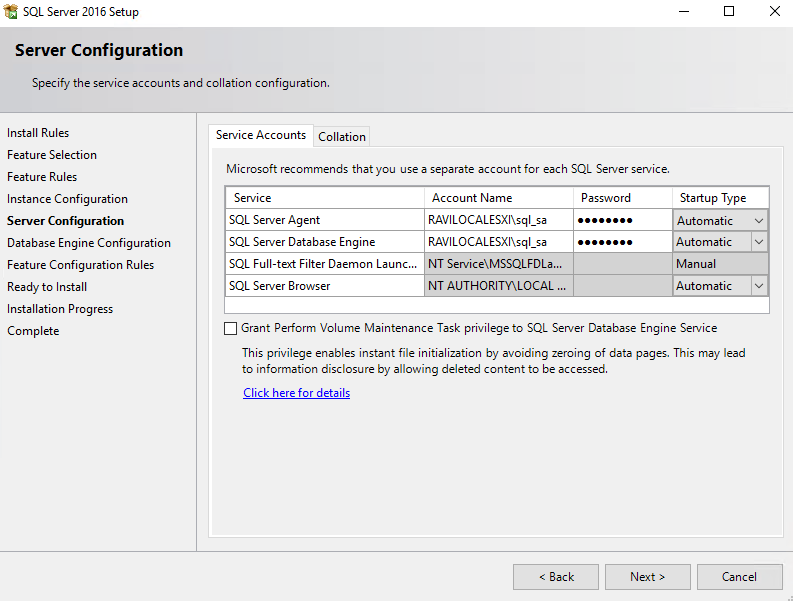 Setting the SQL Server Agent to Automatic, and specifying the service accounts for the two services. 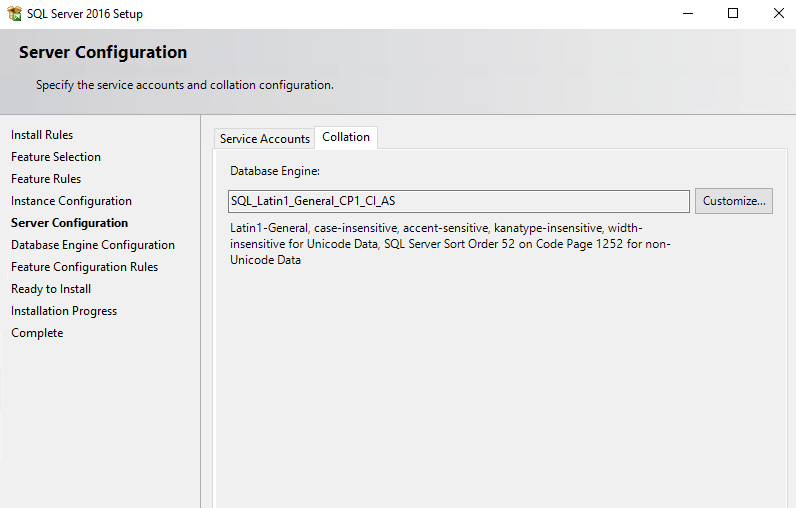 Keeping the database engine collation as default, “SQL_Latin1_General_CP1_CI_AS“. 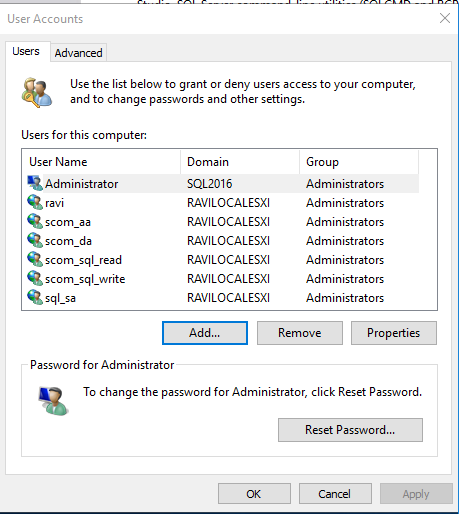 Here, I am adding all the SCOM/SQL service accounts and SQL service accounts as SQL server administrators. Perfect! No errors. Keep in mind, we will need to repeat these steps to create the Data Warehouse instance. Great! 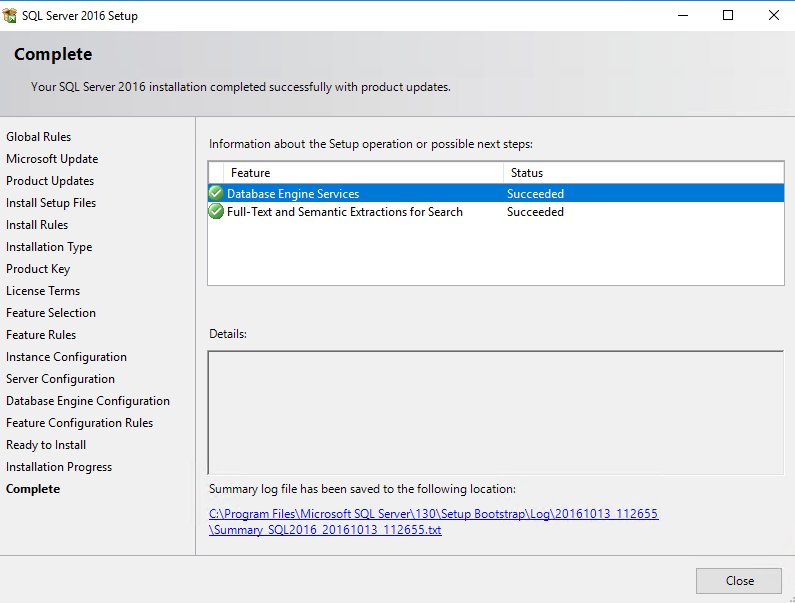 Now we can go ahead with the SCOM 2016 installation! See HERE, for that post.